There is a saying that stresses not wearing your heart on your sleeve. Well, it’s not always good to do so, but what if you held your heart in your hand? Ok. Don’t roll your eyes just yet on what I’m talking about. Follow me for a minute. I was sitting the other day and I thought about how important it was to reach out to others. My money is often funny. My circumstances can cramp my style from time to time. Yet, none of that actually limits me from helping others. This year has taught me a lot. To get anything is to give something. My message is simple, be more thoughtful of others than you are of yourself. Take your heart and hand it to someone. Be there for them. Listen to them. Be a resource for their circumstance that may be cramping their style. Life is about so much more than watching your own goals and dreams blossom. The truth is, your goals, dreams, and aspirations blossom more when you are be a blessing to others’ lives. It’s easy to keep your hand open, waiting for the next best thing to come your way. It takes a stand up, selfless person to see the need someone else may have and actually put your hand in their life. This idea is easier said than done, but as I get older, become more cognitive of this truth, and actually act on it, I see the impact in others’ lives and mine. You can call it karma, the golden rule, a blessing, or whatever, but it’s just the fact in why we exist. If you’re a great listener, then listen to them. If you’re an insightful person, share words of wisdom. If you’re a great cook and they need food, cook for them. If you have a few extra dollars and its money they need, share those dollars. If you’re an awesome comforter, comfort them. It’s the giving of your heart that makes the world revolve more smoothly. Yesterday, today, and tomorrow are all great times to hold your heart in your hand and reach out to give to others! I thought a unique way to consider following your passion(s) was to think of it in terms of molding clay. Think of your favorite decorative vase that sits in the center of your coffee table or that flower pot that holds the plants that you work effortlessly to keep alive. The time it took to make the vase or the flower pot was extensive; tedious even. The person that put their muscle into shaping it to be the admirable piece that you love had to be patient. They had to be diligent and persistent in shaping it to perfect form. If they wanted to see a complete and finished product, they couldn’t give up. Even when the clay seemed to remain stubbornly uneven, without the consistent molding of the clay, the vase or flower pot would never be. 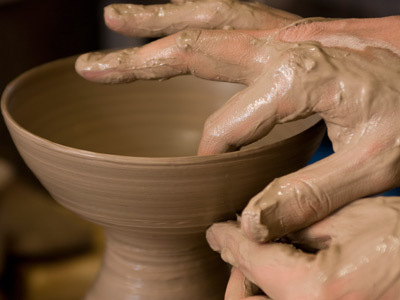 During each stage of the molding, the potter may find themselves re-molding portions of the clay they’d already formed. There is an end to the process, but the process itself includes refining the clay at various points. Defining and refining your passion is so important in terms of finding your happiness in life. You may have determined what your passion is; be it cooking, dancing, writing, singing, or helping others. You can always refine your passion. You always have the opportunity to continuously develop and shape your passion. Yes, you may have found your happiness, but life can so easily bend us and try to reshape us into forms we desire not to be. Every day you should be re-evaluating your passion, reviewing it, studying it, making it better than before. Don’t be discouraged when following your passion reveals some challenges. You will have to smooth out the areas that may sometimes leave bubbles or air holes in your life. Following your passion is no different. Continue molding your passion. Make it your best work yet!